I’ve decided that I’m not a good person to rate this book. This type of romance is out of my genre(s) and I know that people who love them come to them with specific expectation on content and style. I try to review all my books on how it rated within the genre for me, and since I don't have much to compare it to, I'm afraid what I rate it might not reflect it accurately. 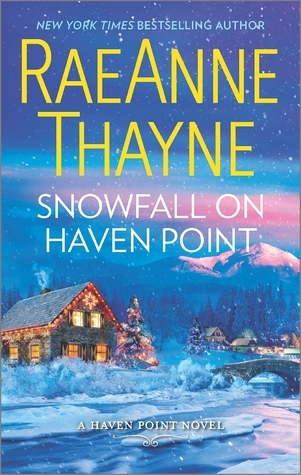 Even though we haven’t even hit Halloween yet, when “Snowfall on Haven Point” hit my doorstep, I figured I would give this Christmas story a try. I found out from LisaLostinLit that it’s actually a series! I had no idea! It read perfectly well as a standalone, but it was clear after knowing it was a series, which parts were carried over from another novel. I'm actually interested in going back and finding Andrea Montgomery's story prior to this one. That one seems like it would be pretty action packed from what we learn about her past in "Snowfall". I think that anyone with a loved one in military or armed services would enjoy this read. Almost all the main characters have served in military, are cops, or are married to cops. So not only does it have a bit of a police-related mystery, it focuses a lot on what it means to have family members in the service. While reading it, I thought of several friends with husbands or family in the police service that I think could relate to this on a deeper emotional level and understanding. All in all, even for someone who isn't very into romance, there was a comforting and cozy aspect of reading this Christmas story that I enjoyed. If you’re looking for a cozy and heartwarming Christmas romance, you might want to give Raeanne Thayne’s series a try! It's definitely one I would recommend people try out before writing it off!